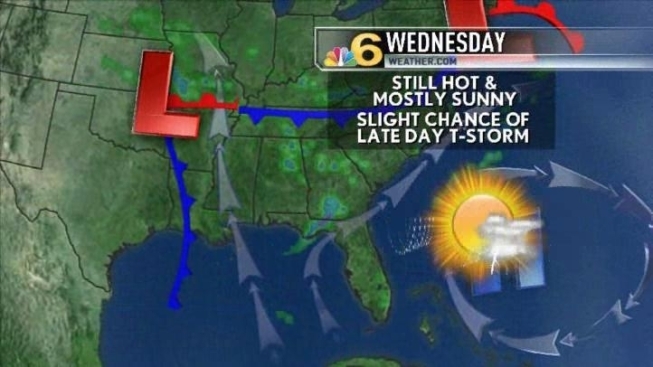 Temperatures will start in the 70s and rise into the upper 80s Wednesday afternoon in South Florida as above average temperatures will come with mostly sunny skies. Though most cities will stay dry, there is a slight chance of a thunderstorm late this afternoon or this evening, including at the 7 p.m. Marlins home opener. Activity will be isolated only. Patchy fog will affect inland communities early in the morning, but it will lift by 9 a.m.
Evening temperatures in the lower 80s will drift back into the 70s after dark. The sun sets at 7:40 Wednesday. The best chance of rain this week will be Friday as a front moves through South Florida. Right now, the thunderstorm chances will be greatest in the afternoon and evening. Clearing will take place into the weekend, but it will become breezy by Sunday.